The sections that follow examine each of these features. Dynamic Security Protection in Internet Explorer is a comprehensive safety and security framework designed to safeguard the integrity of your organization's computers while also helping to protect an individual's personal information. The main features of Dynamic Security Protection are Protected Mode, privacy reporting, and phishing filter. Protected Mode isolates Internet Explorer from other applications running on the computer and restricts how adds-ons are used. Because of Protected Mode, add-ons can only write information to temporary Internet folders and must have explicit consent from the user to write to any other location. Additionally, preinstalled Microsoft ActiveX controls are disabled by default, and you can start Internet Explorer with all add-ons disabled if desired. To start Internet Explorer in Add-On Disabled mode, click Start, All Programs, Accessories, Internet Explorer (No Add-Ons), or right-click the Internet Explorer shortcut on the desktop and select Internet Explorer (No Add-Ons). As part of the Protected Mode enhancements, the URL handler in Internet Explorer has been redesigned as well. The updated URL handler has a new parser, which protects the computer from possible URL parsing exploitations, such as URLs that attempt to run commands. This new parser also features international domain name anti-spoofing, which is designed to warn users if malicious individuals use the new international domain name support to create look-alike domain names. Phishing is a technique whereby a site attempts to collect personal information without a person's consent. Internet Explorer's phishing filter warns you about sites known to collect personal information without consent and also displays a warning when a site attempts to collect personal information without your consent. Related warning icons are displayed on the browser's status bar. With the status bar warnings, however, it is important to keep in mind that the warning doesn't necessarily mean a site conducts or is conducting phishing. Instead, it might only mean that the site isn't a large, wellknown, commercial site. The Phishing Filter is always on by default. In Internet Explorer, you can manage the phishing filter by clicking Tools and then clicking Phishing Filter. If you select Turn Off Automatic Website Checking, you can manually check sites if desired using the Check This Website option. In Windows Vista, the Browser Information Bar is used in place of many of the common Internet Explorer dialog boxes and prompts. The information bar is designed to help users navigate the many security enhancements for pop-up windows, add-ons, and active content. When the information bar is displayed, it appears just below the address bar. Whenever this bar is displayed, you can click or right-click it to display a shortcut menu with additional options that allow you to enable or disable the related feature and perform other related tasks. Table 1 provides a summary of the most common messages you'll see and the related options in the Internet Properties dialog box. Active Content Blocked. To help protect your security, Internet Explorer has restricted this file from showing active content that could access your computer. This message is displayed for any pages that contain scripts or other types of active content that access information on the local computer. Active Content is blocked by default to ensure malicious files accident. You can configure active content blocking by selecting or clearing Allow Active Content To Run In Files On My Computer on the Advanced tab of the Internet Properties dialog box. To allow only this particular page to execute active content, click the information bar. Active content on CD AutoRun pages can be controlled using Allow Active Content From CDs To Run On My Computer. File Download Blocked. To help protect your security, Internet Explorer blocked this site from downloading files to your computer. This message is displayed any time an automatic download or installation is prevented. Downloads are blocked by default to prevent sites from overwhelming users with download prompts and to help resolve problems with accidentally installing unwanted software. You can configure automatic prompting through the Web zone security settings. On the Security tab of the Internet Properties dialog box, select a Web zone by clicking it and then clicking Custom Level. In the Security Settings dialog box, select the appropriate option for Automatic Prompting For File Downloads. To allow only the blocked file to download, right-click the information bar and select Download Software. This message is displayed whenever a page contains a link that opens a new window or a script calls a method, such as window.open(), that opens a new window, and the Pop-up Blocker is in effect. You can configure the blocking of pop-ups by selecting or clearing Block Pop-Ups on the Privacy tab of the Internet Properties dialog box. To configure pop-up blocking exceptions, click Settings on the Privacy tab and set a specific exception. You can also configure an exception for the current site by right-clicking the information bar and selecting Allow Pop-Ups For This Site. Software Install Blocked. To help protect your security, Internet Explorer stopped this site from installing software on your computer. As with drivers, digital signatures are checked before downloading and installing ActiveX controls and other executables. This message is displayed whenever you attempt to install an ActiveX control or other executable with a missing or invalid signature. In general, it is a good idea to block these downloads because they are typically from untrusted publishers and might also represent malicious or undesirable types of files, such as adware. You can configure the blocking of executables by selecting or clearing Allow Software To Run Or Install Even If The Signature Is Invalid on the Advanced tab of the Internet Properties dialog box. To allow only this executable to install, right-click the information bar and select Install Software. Software Blocked. Your security settings do not allow ActiveX controls to run on this page. This page might not display correctly. This message is displayed if running of ActiveX controls and plug-ins is disabled or blocked by an administrator. You can configure the way ActiveX controls and plug-ins run by setting Web zone security settings. On the Security tab of the Internet Properties dialog box, select a Web zone by clicking it and then clicking Custom Level. In the Security Settings dialog box, select the appropriate option for Run ActiveX Controls And Plug-Ins. To allow ActiveX controls and plug-ins only for the current site, right-click the Information Bar and select Allow This Site To Run ActiveX Controls. Enable add-ons To enable an add-on that has been disabled previously, select it and then click Enable. If the option is unavailable (dimmed), the Do Not Allow Users To Enable Or Disable Add-Ons policy might be enabled in Group Policy under User Configuration\Administrative Templates\Windows Components\Internet Explorer. Disable add-ons To disable an add-on, select it and then click Disable. Internet Explorer Crash Detection enables users to disable add-ons that cause problems with the browser. You can control Crash Detection using the Turn Off Crash Detection policy under User Configuration\Administrative Templates\Windows Components\Internet Explorer. Update add-ons If an ActiveX control is known to have an update available (as determined by Automatic Updates), you can select the add-on and click Update ActiveX to update the add-on. Because Windows Vista includes a built-in pop-up blocker, pay particular attention to any browser add-ons that act as pop-up blockers. Many Internet service providers (ISPs), Earthlink included, provide pop-up blockers to their customers. Some firewall and antivirus software includes pop-up blockers as well. Running a third party pop-up blocker in addition to the Windows pop-up blocker can lead to results that can be very confusing. Typically, you'll want to use only the Windows pop-up blocker and disable any other pop-up blockers running on the computer. In most cases, you'll find the Windows pop-up blocker is more configurable than other pop-up blockers, and it's easier to work with as well. 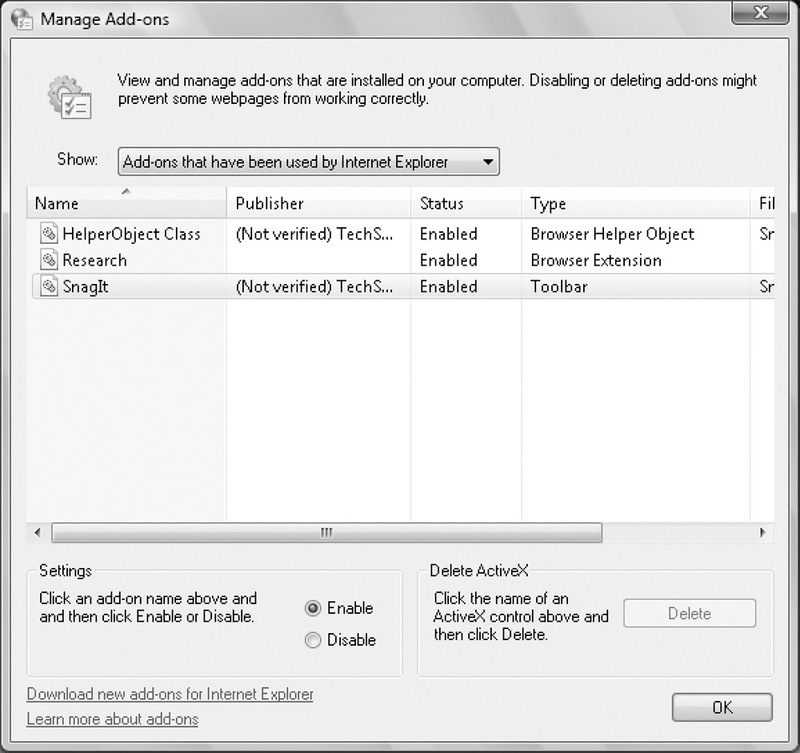 Figure 1: ActiveX controls and other browser add-ons can be enabled, disabled, or updated using the Manage Add-Ons dialog box. A hypertext link contains a command that opens a window when it is clicked. A page element contains a command that opens a window when it finishes loading. A script in a page opens a window after a function call. Because many pop-ups are ads or are otherwise unwanted, Windows Vista includes the Pop-Up Blocker feature. By default, Windows Vista is configured to block most types of automatic pop-ups and display the Information Bar whenever pop-ups are blocked. A user could then right-click the Information Bar and select Allow Pop-Up to display the pop-up or right-click the Information Bar and select Allow All Pop-Ups For This Site to configure the site as an Allowed Site automatically, which unblocks (or allows) pop-ups from this site. Access the Internet Properties dialog box in Control Panel by clicking Network And Internet and then clicking Internet Options. Then select the Privacy tab. To disable pop-up blocking, clear Turn On Pop-Up Blocker and then click OK. Skip the remaining steps. 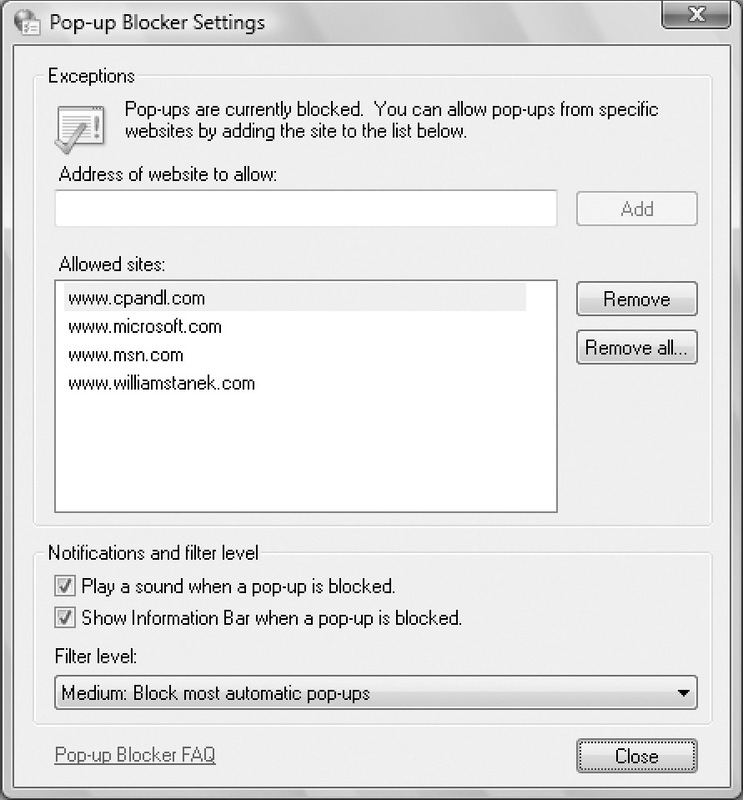 To enable pop-up blocking, select Turn On Pop-Up Blocker and then click Settings. This displays the Pop-Up Blocker Settings dialog box, shown in Figure 2. Figure 2: Use the Pop-Up Blocker Settings dialog box to configure the way pop-ups are blocked. To allow a site's pop-ups to be displayed, type the address of the site in the field provided, such as http://www.msn.com, and then click Add. This site is then permitted to use pop-ups regardless of Internet Explorer settings. By default, Pop-Up Blocker is disabled for sites in the Local Intranet zone. That said, you still might want to configure exceptions for internal sites if these sites call the window.open() method in scripts or use similar methods to open windows. In this way, you ensure pop-ups for internal sites aren't blocked, regardless of the browser settings. You can also configure exceptions through the Pop-Up Allow List policy under User Configuration\Administrative Templates\Windows Components\Internet Explorer. To stop displaying an information message in the browser when pop-ups are blocked, clear Show Information Bar When A Pop-up Is Blocked. q High: Block All Pop-Ups (Ctrl+Alt To Override) Pop-up blocker attempts to block all pop-ups. If you click a link that would normally open a pop-up and you want to see the pop-up, press Ctrl+Alt while clicking to open the pop-up. q Medium: Block Most Automatic Pop-Ups Pop-up blocker attempts to block the types of pop-ups most commonly used to display ads or other unwanted content. Some types of new windows are allowed. Again, you can press Ctrl+Alt to override blocking while clicking a link. q Low: Allow Pop-Ups From Secure Sites With standard (HTTP) connections, Pop-Up Blocker attempts to block the types of pop-ups most commonly used to display ads or other unwanted content. However, Pop-Up Blocker allows pop-ups when you are accessing a site using a secure (HTTPS) connection.